DELAY Knob — Sets the delay time from 52 mS to 1100 mS. As you turn the DELAY knob clockwise, the delay time will increase. If you tap in the delay time, the DELAY knob’s setting will be ignored until you move it again. If you turn the DELAY knob after tapping in a delay time, the DELAY knob’s setting will supersede the last tap tempo that was entered. Turning the DELAY knob, while listening to your echoes, will bend the pitch of your notes. The DELAY knob can also be used to set the maximum delay time for expression pedal control. N.B. : the TAP DIVIDE button functions have no effect on the DELAY knob; pressing this button when the DELAY knob controls the delay time will not change the delay time. clockwise position will cause the DMMTT to run-away, or self-oscillate. Alternatively setting the FEEDBACK knob to its minimum position will yield just one echo or repeat for each of your notes. The FEEDBACK knob is also used to set the maximum amount of feedback for expression pedal control. DEPTH Knob — Sets the amount of modulation that is applied to the delay time. As you turn the DEPTH knob clockwise, the amount of modulation increases. Turn the DEPTH down to the full Counter-Clockwise (CCW) setting to turn modulation off. The DEPTH knob is also used to set the maximum amount of modulation for expression pedal control. RATE Knob — The RATE knob’s main function is to set the rate or speed of modulation. As you turn the RATE knob clockwise the modulation rate will increase. The DEPTH knob must be set above the full CCW position to hear the RATE knob change modulation speed. Additionally the RATE knob sets the maximum rate of modulation for expression pedal control. GAIN Knob — Sets the input gain for the DMMTT. As you turn the GAIN knob clockwise, the input gain will increase. The total gain range is -13 dB to +20 dB. The gain block is the first stage that the input signal goes through in the circuit. Both the dry and wet signals mixed by the BLEND knob go through the gain block. BLEND Knob — The BLEND knob is a wet/dry control allowing you to vary the mix between direct and delayed signals at the OUTPUT jack of the DMMTT. Set the BLEND knob to the full clockwise position for an output that is 100% wet. Set the Blend knob to full counter-clockwise for an output that is 100% dry. Setting BLEND anywhere in between will mix the wet and dry signals together. Additionally the BLEND knob sets the maximum wet/dry mix for expression pedal control. BYPASS Footswitch and STATUS LED — The BYPASS FSW is used to toggle the DMMTT between effect mode and true bypass mode. The red STATUS LED will light up when in effect mode and turn off in bypass. EXP. MODE Button and LEDs — The EXP. Mode button cycles through the six available expression modes: BLEND, RATE, DEPTH, FEEDBACK, DELAY and OFF. Each time you press the EXP. MODE button the DMMTT will advance to the next expression mode LED. An expression pedal must be plugged into the EXP. PEDAL jack to make use of these modes. A lit LED for one of the modes indicates the expression pedal will control that parameter. For example, if the RATE LED is lit, the expression pedal controls the modulation rate, from slowest (expression pedal = toe up), to the RATE knob’s current setting (expression pedal = toe down). When no EXP. MODE LEDs are illuminated the expression pedal is disabled while it remains plugged into the DMMTT. The setting for the EXP. MODE is saved and recalled when power cycling. TAP Footswitch — The TAP FSW is used to tap in the delay time. Stomp on the TAP FSW two times and the delay time will jump to the time between taps (if all the TAP DIVIDE LEDs are off). If you tap more than twice, it will average the tap tempo for all taps, it will stop averaging if there is more than 2 seconds between two consecutive taps. The DMMTT will always take into account the TAP DIVIDE setting when determining the delay time from the tap tempo. For example, if your tap time is 1 second and TAP DIVIDE is set to eighth notes, the actual delay time will be 0.5 seconds. The maximum delay time, when tapped in, is 1.5 seconds; though at this delay time the effect will sound quite lo-fi. The DMMTT will save and recall the tap tempo when power cycling. In addition, if an expression pedal is controlling the delay time, the Tap Tempo and TAP DIVIDE setting will determine the maximum delay time of the expression pedal. N.B. : The delay time for the DMMTT is always set by the last method used. If you tap in a delay time, the DELAY knob’s setting is ignored. After tapping in a delay time, if you turn the delay knob, the tap time will be forgotten and replaced by the current position of the DELAY knob. TAP FSW HOLD TO PRESET FEEDBACK — If you press and hold the TAP FSW, the DMMTT will slowly ramp up to a high FEEDBACK setting. After releasing the held TAP FSW, the feedback amount ramps back down to the current FEEDBACK knob setting. The high feedback setting that the DMMTT ramps up to is set at the factory but may be adjusted when you are holding down the TAP FSW, if held for more than 1 second. If you do not like the setting chosen at the factory, simply turn the FEEDBACK knob to your preferred setting, while the TAP FSW is held down. It may take a few tries before nailing the perfect setting. Release the TAP FSW to save the feedback hold setting. The DMMTT will remember the TAP FSW HOLD setting after power cycling. If you want to restore the original factory setting for the FEEDBACK HOLD, press and hold the EXP. MODE button while applying power to the DMMTT. When you see all 5 expression mode LEDs light up, the factory setting has been restored, you can now release the EXP. MODE button. BEAT LED — The green BEAT LED either blinks at the current delay time setting (if delay time is set by the DELAY knob) or the tempo that you tapped in. Cycling through the TAP DIVIDE settings will not change the BEAT LED blink rate. If you are modulating the delay time, the change in delay time due to modulation will be reflected in the BEAT LED. N.B. The TAP DIVIDE button has no effect on the delay time when the delay is set by the DELAY knob. Cycling through the different TAP DIVIDE modes, when the delay time was last set by the DELAY knob, will not change the delay time in any way. The TAP DIVIDE button setting is saved and recalled when power cycling. 1. Tap in a delay time. Tap Divide Sequence mode will not work if the delay time is set by the DELAY knob. 2. Press and hold the TAP DIVIDE button for 2 seconds. After 2 seconds, all of the TAP DIVIDE LEDs will light up briefly, now you are in sequencer mode. You can release the button. 3. Turn the RATE knob to change the speed of the sequence. You should see the tap divide LEDs light up in a sequential fashion. 4. You can tap in new delay times to change the delay time range. 5. To exit Tap Divide Sequence mode: hold down the TAP DIVIDE button for another 2 seconds. All 5 LEDs will light briefly to indicate you have exited sequence mode. You could also simply turn the DELAY knob. INPUT Jack — Connect the output of your instrument or other effects pedal to the ” INPUT jack. The impedance presented at the INPUT jack is 100 kï�—. OUTPUT Jack — Connect the output of the DMMTT to the input of an amplifier or another effects pedal. The output impedance is 200 ï�—. SEND Jack — Connect this jack to the input of another effects pedal or chain of effects pedals to insert an effects loop before the DMMTT’s delay block. RETURN Jack — Connect this jack to the output of another effects pedal or chain of effects pedals to insert an effects loop before the DMMTT’s delay block. The input impedance presented at the RETURN jack is 2 Mï�—. 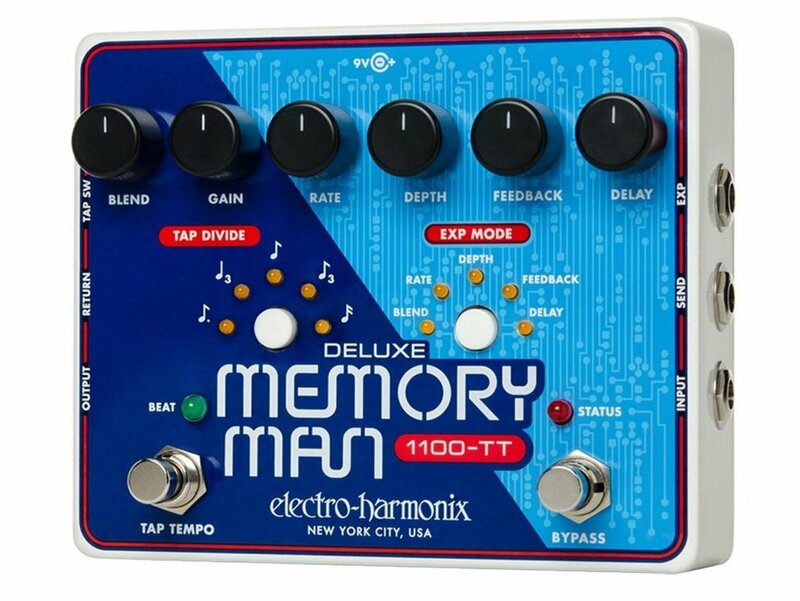 EFFECTS LOOP — The Deluxe Memory Man w/ Tap Tempo has an effects loop feature which allows other effects to be inserted into the feedback loop of the delay block, before the bucket brigade chips. This means that you can put additional effects on your wet signal without changing your dry signal and each time your notes go around the feedback loop, they will also go through the effects loop. For example, if you connect a Micro POG in the DMMTT’s effects loop, setting the Micro POG to output only the upper octave, the delayed note will be one octave above the dry note that you played. Additionally, with a fair amount of feedback on the DMMTT, each time the note circles around the delay loop, the signal will go up another octave. So if you play a C2 on the guitar, the first echo will be a C3, the second C4, the third C5 and so on. Another example would be to plug a volume pedal into the DMMTT’s effects loop. The volume pedal will act as a FEEDBACK control. With the addition of an expression pedal, you could have two pedals controlling parameters on the DMMTT. To properly use the DMMTT’s effects loop, connect the SEND jack to the input of your effects loop and the RETURN jack to the output of your effects loop. N.B. If you do not wish to use the effects loop, please leave the RETURN jack disconnected. EXP. PEDAL Jack — Enables the musician to control any of the five available expression modes with an optional expression pedal or control voltage. The expression pedal should have a Tip-Ring-Sleeve plug attached to it. It is important that the expression pedal have the correct polarity. The tip of the plug must be connected to the wiper of the potentiometer inside the expression pedal. If you are not sure what type of expression pedal to use, try to purchase one with a polarity switch so that it will work with many different types of instruments. Some suggested Expression Pedals: M-Audio EX-P, Moog EP-2, Roland EV-5 or Boss FV-500L. You may also connect a control voltage on TS plug to this jack. The Control Voltage range must be 0 V to 5 V.
EXPRESSION PEDAL CONTROL — The Deluxe Memory Man w/ Tap Tempo allows external control over five of its parameters: BLEND, modulation RATE, modulation DEPTH, FEEDBACK and DELAY time. Please see the EXP. PEDAL Jack section above for suggestions on the type of expression pedals to use. The pedal will need to have a TRS plug. In addition you may use a control voltage, with a TS plug. The acceptable CV range is 0 V to 5 V.
Use the EXP. MODE button to choose the knob you want to control with an expression pedal; repeatedly press and release the EXP. MODE button until the proper LED lights. After selecting a parameter, its associated knob will now set the maximum sweep range, which is the toe down position for the expression pedal. For example, if you want to sweep the full range of the FEEDBACK knob, you will need to set the FEEDBACK knob to its full clockwise position. The expression pedal will then sweep from 0% feedback (toe up position) to 100% feedback (toe down position). Some expression pedals allow you to dial in the toe up position using an extra knob on the pedal itself. When using this type of pedal you can set the range for both toe up (using the knob on the expression pedal) and toe down (using the selected knob on the DMMTT). If you use an expression pedal that does not allow you to dial in the toe up position, then toe up will always be that particular knob’s minimum setting. TAP SW Jack — Allows the musician to input the tap tempo from an external momentary switch. The external switch should be normally open. Upon engaging the switch, it should create a short circuit between the Tip and Sleeve of the plug inserted into the TAP SW jack on the DMMTT. Releasing the switch should open the circuit between the Tip and Sleeve. The TAP SW jack is connected in parallel with the TAP FSW on the DMMTT so they can both work at the same time. A suggested Momentary Footswitch that has been tested with the DMMTT is the Boss FS-5U Momentary Foot Switch. TAP SW Jack Extra Control — If you are handy with a soldering iron, you may also make connections on the DMMTT’s PCB to allow external control of either the TAP DIVIDE button or the EXP. MODE button by connecting an external momentary switch between the Ring and Sleeve of the TAP SW jack. To enable external control of the TAP DIVIDE button, short together the pads of R139 on the DMMTT PCB. R139 is labeled TAP DIV SW and is located just above the 10-Pin IDC header, CN6. To enable external control of the EXP. MODE button, short together the pads of R140 on the DMMTT PCB. R140 is labeled EXP FUNC SW and is located above the 6-Pin IDC header, CN5. These external switch connections work in parallel with their associated buttons on the DMMTT. If either of the buttons have been enabled for external use, a TRS plug must be inserted into the TAP SW jack. In this circumstance, if a TS plug is inserted into the TAP SW jack it will be equivalent to holding down whichever button has been enabled for external use, without the ability to release the button. 9V PWR JACK — Connect the output plug of the supplied AC Adaptor into the 9V power jack at the top of the DMMTT. The DMMTT’s current requirement is 200mA at 9VDC. The polarity of the power jack is center negative. The maximum allowable power supply voltage is 10.5 VDC. The Feedback Hold setting, along with the original EXP. MODE and TAP DIVIDE mode, can be restored to their original factory settings by holding down the EXP. MODE button during start up. Press and hold the EXP. MODE button, then apply power to the DMMTT while continuing to hold the EXP. MODE button. Once you see all five EXP. MODE LEDs light up solid, you may release the button. The factory settings have been restored.